The icon of Mary and the infant Jesus was commissioned in memory of his wife by John Croston, a member of St Mary's 8 am Sunday congregation and painted by Mother Julia Bolshakova, a Russian icon painter who works in Kondopoga, Karelia, Russia. In the 1930's religion was declared eradicated from Karelia but in 1991 locals successfully petitioned for a priest, being sent Father Lev Bolshakov and his wife Mother Julia. Working alongside St Gregory's Foundation and the Order of St Lazarus, the parish runs a soup kitchen (which feeds up to 100 people daily) and a farm, provides training and employment in its sawmill, carpentry, icon and sewing workshops , as well rehabilitating ex-prisoners, recovering alcoholics and others in need of social support, such as the disabled who are heavily stigmatised. The icon-workshop provides the only income for Father Lev and his family, and also helps to finance the social work of the parish. Kondopoga icons hang in a number of churches in Britain. 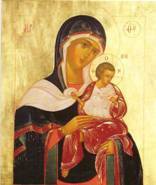 Mother Julia and Fr Lev visited St Mary's in 2002 when John presented the icon.